Hiring the best freelance web designer may seem a bit overwhelming. This is because you don’t want to end up with a scammer or a designer who is annoying. That is why you need to look for legitimate sites and people with experience in web designing. But how do you find these sites or web designers? You may have scrolled through the internet and you are not sure who to pick or the particular website to work with. I am here to help you out and ensure you get a professional designer, who will work on your website and provide excellent results. Getting such a designer requires you to understand the basics of web designing and understand what is entailed in this subject. This means you have to lay out your plan and questions to ask the website designer. Also, ensure you get into a contract with a freelance web designer to avoid conflicts later. 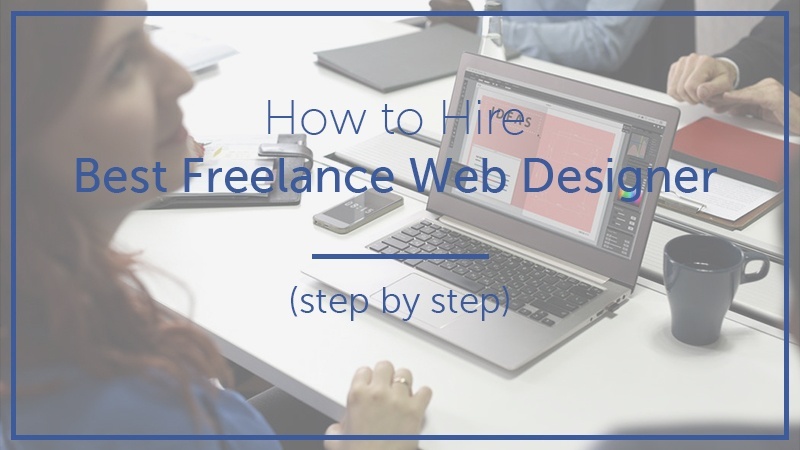 Before we head on to the details on how to hire the best freelance designer and where to hire such freelance web designers, let’s look at an important distinction. Here is a difference between a web designer and web developer, knowing this will help you know which kind of professional you need. A web designer will be responsible for creating the look and the feel of your website. This implies that he will work with you in choosing the colors, designing logos or brands, website layout, and organization of your site’s content. A freelance web developer, on the other hand, builds a functional website using the designer’s mockups. Web development involves customization of existing theme or building a customized theme and adding functionality to include troubleshooting. You may hire both a designer and developer or ask your hired web designer to develop your website or blog. Now that we know what web designing is all about. Let’s have a look at how to hire professional web designers. How will updates be made to the website? Will the designer do some maintenance and upgrades in the long run? What is the designer’s view of your brand and effective web design? You can choose to hire a web designer from these online freelance sites. In these platforms, you will get a lot of freelancers with different pay rate and designs. But our main focus will be on acquiring the best freelance web designer. Let me show you how to do that on the platforms I am going to mention. This platform is the best when it comes to hiring web designers. The owners have added various features which are beneficial to you and the freelancer. First and foremost the system is easier to use. The project management tool allows you to see the history, documentation, images and the payment schedule of freelancer or freelancers you choose to work with. An important project management tool in this platform is the time tracking tool. The system will periodically track and monitor the time taken to work on the project you submitted to the freelancer. It will take screenshots of what the freelancer is doing and provide the visual confirmation to the hiring party. The tool will provide the peace of mind and accountability needed so that you are aware that the freelancer will not scam you or do other unrelated work. Another important feature is the payment tool. You are able to configure the system to allow payment in milestones. Once the milestone is met and you have approved money is released to the freelancer web designer. The system configuration allows you to check the work so that you may not to receive a poor job; hence you are able to receive a job that meets your expectation. There is also a standardized test that the freelancer will do before being accepted in this job platform which allows you to know who scored over 90%. To hire a freelancer in this platform you need to sign up as a client, meet the necessary qualifications and adhere to the rules. After doing that, you will post an advertisement for the job you need to be worked on. In this case, web designing, outline what you want and give instructions. Once you through provide a payment plan and you are all set. The next step will involve potential freelancers sending their proposals. Then from there, you can vet the freelancers on the job they have done for others, their rating and customer reviews and also on delivery. Having all these at hand will help you in choosing the best freelance web designer and you will also have the assurance that the job will be done. The site also includes a dispute resolution mechanism in case a problem has risen in between you and the freelancer you hired. Another incredible platform is Fiverr. It is very easy, dependable, quick and affordable. In this platform, after creating an account and conforming to all the necessary regulations. All you have to do is to use their powerful search engine which is named according to the type of job you wish for a freelancer to work on. You will search web designing jobs and a list of all freelancers with this skill will be provided. To find a professional designer, look at their profile. You will get all information including customer ratings, the time taken to complete the project, customer reviews and also their pay rate. From these items, you are now able to hire the best among the freelancers in this platform to work for you. Once the freelancer is done with the project, you will then be requested to approve the job done and allow the release of payment. While approving, you will be able to check if the freelancer has followed your instructions and provided the design that you needed for your website. If not, you can ask him to revise or cancel the contract altogether and hire another freelancer. On this platform, you will only get exceptional freelance talent. The platform will do most of the work for you as opposed to other sites. Toptal will perform a rigorous screening test on all freelancers who wish to be enlisted in the platform. They will conduct a background check and screen all the freelancers. They will then provide you with a shortlist of the best freelancers who work on web designs. Just like a recruiting company they will provide (the top 3% freelancers) to work with them. Freelancers who are enlisted are the ones who will provide you with quality work hence you will only get professional designers. Your obligation is just to sign up for a hiring party and get only the top web designers who will work on your website. This makes the site among the best while acquiring freelancers in 2018. Shopify is the best hosted e-commerce website design platform. Their main advantage is the pool of experts enlisted in this site. All the experts are pre-screened before they are enlisted as freelancers in e-commerce website design. Shopify will list them in Shopify Experts Marketplace and then you can choose the freelance expert to work on your e-commerce projects. The experts will be required to meet Shopify quality control and hence only freelancers with highest standards are accepted. You will never have to worry anymore about acquiring the best e-commerce freelance designer while using this platform. In this site, there are various professional designers, particularly graphic designers. In the case of website design, you will post the job on the platform and wait for multiple freelancers to present their designs. Once you have chosen a particular design you pay for it. This site enables you to choose a winning design and therefore it is easier to find custom website designs from different freelancers on this site. Squarespace is a drag and drop website builder and ranked among the best website builders. Being design-oriented, the templates they used are gorgeous. That is why the site is appealing to most people. With this site, you are able to acquire custom website designs, Complete website building services, and added functionality. All these you will acquire without even having any knowledge of how to code. Now that you are aware of where to hire freelance web designers and how to hire them on these platforms, we have to check on some of the items to consider while hiring freelance web designers in 2018. Once you have the project outline. Create a job post that is appealing and has clear instructions. The job post will easily interest the best web designers who will surely work on your project. The next aspect is going through the proposals of interested freelancers. This requires you to look for web designers who follow certain practices like. Your web designer should take into account details like font size, button color and placement and the color scheme. Such details can have an impact on conversion rates. Considering these details will make your site to be user-friendly. Try focusing on designers who understand your objectives. You will do this by having a comprehensive discussion with the designer before hiring them. Communication will be the key to getting the desired results. Web design does not only involve instincts but it is driven by data. Just test the site to the focused group, analyze results and change accordingly. The site you are building should support your business goals. The web designer should be able to create a good balance between a good design and your business needs. These are questions you need to develop when speaking to a potential web designer. The answers given will help you in hiring only the best-suited web designer for your project. You will also learn whether your approach aligns with the potential web designer. You may need to update the web content or hire someone to do this for you. Discuss such an issue with the web designer so that you may be able to know which approach works for you or your team. You have to ask whether the potential web designer will help you out in maintaining and upgrading your website. Asking such a question will help you know which option is available or whether the designer can help you out. If he agrees on this long-term obligation, inquire about the cost involved. You also have to both agree on such a matter before handing out your project. This question will enable you to get the first-hand impression of designers-view on your brand. The answer given will clarify any misunderstanding that might occur in the course of work. Also, his view on the better design will help you know if his expectation aligns with your needs. It will also be clear to you the intensity of the research they have done and whether you can easily promote your brand using the existing materials. Hiring the best freelance web designer involves knowing the potential freelancer, creating a detailed project scope and using the appropriate job portal which suits you. Always look out for the job success of each freelancer and whether his expectation meets your needs. Better communication will help you understand which of the freelancers listed on various platforms are the best and also creating a mutual relationship after a successful job is done. Note that web freelancers who provide quality work will always charge more. Ensure that your website building project is on a budget you can afford. In this article, I have highlighted to your sites and the ways to hire the best web designers. Once you go through it, you will find that it is an easier process.